I'm feeling a little kookie thinking about a pre-human superstar named "Lucy." Imagine, if you will, it's the summer of 1974 in Ethiopia and a team of archaeologists have discovered a complete fossilized skeleton that's hailed as a major find. That skeleton of a pre-human called Australopithecines, has led to a more complete picture of those tiny human forerunners scientists have been studying for so long. Let me tell you a little bit about Lucy. She was 3.5 feet tall and her feet were made for walking. She had really strong arms that could have swung her up easily into trees. Scientists sitting around at night by camp fires have long debated whether Lucy and her kind lived and foraged in trees, or spent their days on the ground. 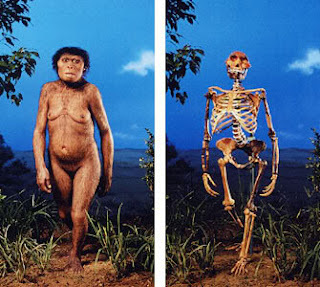 Scientists have been studing Lucy's little skeleton since she was discovered and recently decided she was killed from falling from a great height. Which leads me to why they called their discovery "Lucy." Are you ready for this? Because they were listening to the Beatles song "Lucy In The Sky With Diamonds" while they worked.